“Seven Deadly Sins” was similarly re-jigged here to emphasize the synths, though ironically, the drum track was no longer a white noise patch. The new drum track sported a thicker bass profile and the solos that had once been [gasp!] blues-based guitar riffs were now performed by Sky on synth. With that, the original album had run its course, but there was one more thing. The band had reached out to James Grant of Love + Money to write a song for the last Visage album. He was given the title, backing track and seed lyrics by the band but before Strange could record the song for “Demons To Diamonds, he suddenly died. The track had been tipped as the lead single but we’d never hear Strange singing it. The band then asked Grant to perform it and thus James Grant got a bonus track credit on a Visage CD as “James Grant: Heartbleed [Visage remix].” How is it? It’s a poppier track, more in line with a tune like “Dreamer I Know” than a scorcher like “Never Enough.” The song was largely a duet between Grant and Lauren Thomas with heavy synthpop seasoning up front and expressive Robin Simon and Logan Sky solos on the back end. I have to admit that it’s …strange hearing what is otherwise Visage with a jut-jawed singer who actually has vocal chops crooning over the band. Steve Strange was many things, but no one would mistake him for a vocalist’s vocalist. In that respect, “Heartbleed” sticks out in that it lacks the strange edge that was part of the package for this band. In the end, it will be the final time we get to hear this great band in the studio, and Grant has crafted a lovely, bittersweet lyric that was certainly about Steve, so it stands as a touching tribute. At the end of the day, I have to admit that my favorite versions of the tracks are split between each disc, making the “Ultimate” version of Visage’s final album a matter of compiling it. The biggest winners on this disc were definitely the longer, 12″ length cuts. They were every inch the CD singles not released, and they were clearly magnificent. The rest tends to downplay Robin Simon’s contributions to the band. Sometimes, they get away with it, but at the end of the day, I’m such a huge fan that I wish that there was room for guitars and synths here, though subtracting/substituting instruments is undeniably an effective was to generate a remixed version of a song. Intriguingly, with Steve Barnacle’s bass playing, some tracks here had him switching from guitar to synth as well as vice versa. Where he was able to cut loose on a guitar, the results were pretty definitive. The strangest thing about this project was how it was released just a few weeks after the original album hit my Record Cell! I felt as if I didn’t have sufficient time to come to grips with the final Visage album before it was being supplanted with this CD. How much better, I think, it would have been if the remix album had waited until later in this year, at the earliest, to manifest? I realize that earlier Visage remix albums [“Fade To Grey – The Singles Collection” or “Beat Boy“] were released concurrently with their respective primary albums, but with Steve gone, I felt that I already had a lot to process about what was happening without a remix album muddying the already churning waters. At the end of the day, both CDs were welcome additions to the Visage canon that will be cherished as the band blazed back into life in 2013 to burn brightly for a little over two years with a wave of releases that I am still trying to completely nail down in my Record Cell. The live touring they did after “Hearts + Minds” seemed to have played a big role in the vibe that “Demons To Diamonds” had that was redolent of a living, breathing band. This, being remixes, captured the more typical club vibe of the band, but in either case, the emotional tenor here was still a completely different animal to the Visage releases of 1980-1984. The final wave of Visage from 2013-2016 was the product of human beings and not simply highly skilled technicians. How I’ll miss this band. This entry was posted in Core Collection and tagged 2016, remix, Visage. Bookmark the permalink. Monk, all your feelings, and they are certainly feelings, rather than just reviews, touch on some of the same I had upon receiving Darkness To Diamond. 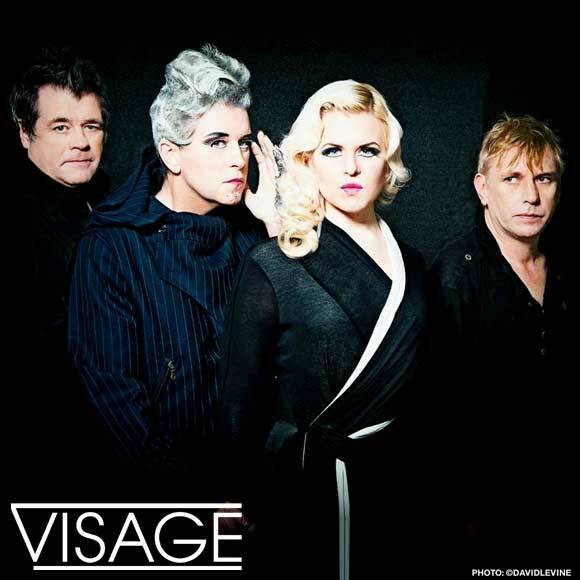 I understand the sense and even concept of releasing the remix collection right on top of the album – there was much that timing can do to keep the fires burning for a band like Visage. Would some more time have been a benefit to digesting the work? Yes, but where Hearts + Knives had the luxury of time to evolve and influence the recording of Demons To Diamonds, there would be no such opportunity. I’m sure there was a cathartic element for all involved as well in not putting off or losing focus on these versions. As well, the remix album puts a exclamation point on the work of Visage, rather than a ellipsis, which would never be completed. Echorich – Good point. To say nothing of getting the remix down before the band went their separate ways. I still maintain that they were a band who could have stayed together with a new singer and a new name to go with it. The core of Sky, Barnacle, and Simon I’d follow anywhere. So great to read your views on this album.I live both of the albums,and can’t pick a favourite.Like PPM I feel a bit of each is needed when listening. “Heartbleed” is probably my most listened to song in years,I just can’t get enough of it and it fills me with such sadness too as I remember Steve’s fragility,and dignity in his later years, as a human being-those lyrics really hit the spot.